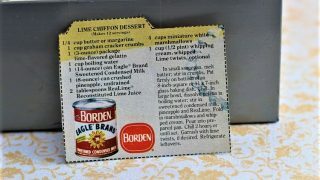 Front of the recipe card for Lime Chiffon Dessert. 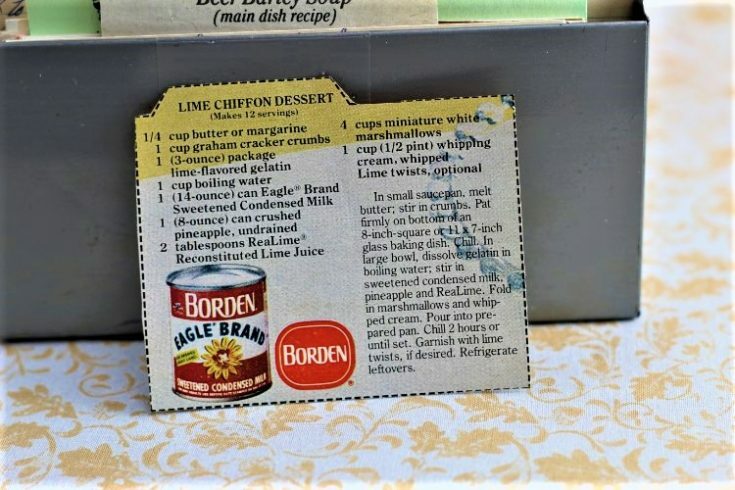 There are lots of fun recipes to read in the box this recipe for Lime Chiffon Dessert was with. Use the links below to view other recipes similar to this Lime Chiffon Dessert recipe. If you make this Lime Chiffon Dessert recipe, please share your photos and comments below! In small saucepan, melt butter; stir in crumbs. Pat firmly on bottom of an 8-inch-square or 11 x 7-inch glass baking dish. In large bowl, dissolve gelatin in boiling water; stir in sweetened condensed milk, pineapple and ReaLime. Chill 2 hours or until set. Garnish with lime twists, if desired. Refrigerate leftovers.